Babies may be small but they need so. much. stuff. You also end up accumulating even more than what’s necessary which is great for reusing with any subsequent children, but what happens when your baby days are over? Here are five ways to clear the decks without resorting to a rubbish skip. This seems like a no-brainer but you’d be surprised at how many people forget to dig out their stuff and pass it on to those around them. Not only can it save family and friends hundreds of dollars, but you can usually pass on items that charity organisations can’t accept, such as baby bottles, change mats or jolly jumpers. Put a system in place that helps you pass on the items you no longer need as soon as your bub outgrows them. You could start a Facebook group for your mum friends and post photos as you go so you don’t have to store them for years to come. Although there are a number of items not accepted by charity organisations, there are still plenty of secondhand baby products that will be gratefully accepted. These include wooden or plastic toys, books, cots, baby clothes and blankets. If you’re unsure, you can ring your local Vinnies or Salvos stores for the lowdown, or contact a baby specific charity such as St Kilda Mums or Baby Give Back who take a wider range of baby related products. There are even non-profit organisations who will take more obscure items such as worn maternity bras (Uplift Project) or pillows and faded/slightly stained bedding (most animal shelters). If you’re keen to make a bit of cash then get snapping and pop some items up on eBay. Gumtree, Freecycle or buy/sell/swap sites are other great options if you want your items to go to a good home but don’t want any money for them. Simply list it for free and someone will come and collect it from you, or request to swap it for something else. Old school bartering at its best! 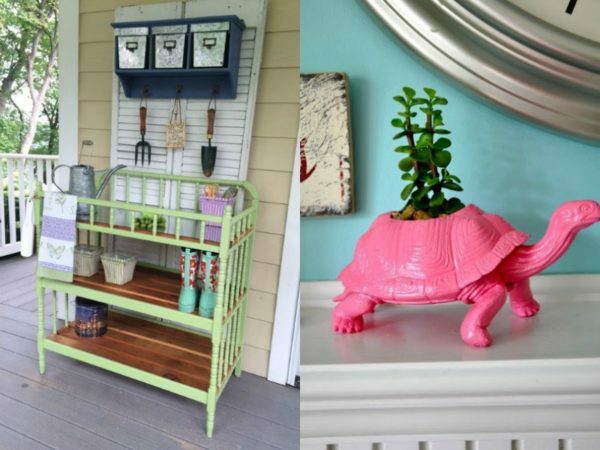 If you’re the creative type, or just feel like giving DIY a whirl, then give your baby stuff new life by repurposing it into something else that’s either useful, looks great, or both. Transform a change-tables into a storage unit for gardening or the office, or if you have one on wheels you can turn it into a chic drinks trolley for your next dinner party. You could also turn glass baby bottles and jars into vases, old plastic toys into funky plant holders, build a child’s desk out of a cot, and make quilts out of old baby clothes. The options are endless! If you’ve exhausted all options for donating, selling or reusing, then it’s time to look at recycling. Of course you can dispose of glass bottles in the council recycling bins, but did you know that some cloth fabrics will break down easily in the compost? Another fantastic option is to bundle up all of those yucky, old and stained bibs, blankets, spew rags, clothes, sheets and any other fabric items that’s too worn to pass on, and take them to the retail store H&M. They have an amazing initiative where you can drop off a bag of old fabrics and receive a discount voucher in return. They will then use these fabrics to create awesome new recycled clothing items for their H&M Conscious range. Brilliant! So if you’re drowning in baby paraphernalia that you no longer need, then it’s time to get busy sorting and clearing out the clutter. Trust us, it will be a weight off your shoulders – and you’ll also need all the room you can get when your tweens and teenagers start bringing home more stuff! What are your tips for getting rid of all your old baby things? Tell us on Facebook!